Upon entering Michel Majerus' Leuchtland (in English, "Lightland," or, perhaps, "Luminousland") at Friedrich Petzel, one is immediately confronted by a large acrylic and silkscreen work that replicates the somewhat malevolent invasion force of the Space Invaders videogame. Majerus -- himself a bit of an invader in his first U.S. solo show -- sets the tone for an analysis of singularity versus multiplicity by reminding us that not even these invaders are originals. They too are inherently derivative -- indeed, one realizes by the title, Space Invaders 2, that the space invaders represented herein are not even a part of the initial invasion force (arcade game), but the subsequent follow-up invasion force (arcade game). In simultaneous critique and homage, Majerus asserts that inspiration is not merely the isolated act of the individual -- nor is it a striving for genius. It is, rather, evolutionary, and motivated ulteriorly -- an argument advanced in the second work in the show, an abstraction of happenstance accumulation, Splash Bombs 2. Next, Your Bad Taste depicts the orange head of another space invader/monster, who is an embodiment not only of yellow "corn" (maybe real, maybe plastic), but of the creature that is literally molded by outwardness (economy, culture, etc.). Pathfinder, which follows, furthers the reach and self-folding of Majerus's presentation. 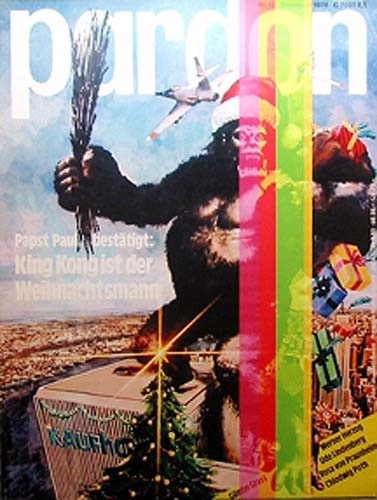 King Kong straddles the Twin Towers on a 1976 magazine cover -- although the medium, inkjet on vinyl banner, is distinctly contemporary. The wide array of mediums and brush marks that Majerus employs is evidence of the broadness he draws upon, as well as a confession of his own bias and decision-making process in reconstituting that broadness. Bravo, a fifth enormous work, reproduces a variety of cable television advertisements by way of "chemically bonded vinyl banner on Phenolic honeycomb bonded panel." Not to leave "art" out of Majerus's equation, Pressure Groups 1, Pressure Groups 2 and Pressure Groups 3 seamlessly include the stylistic tendencies of, for example, Frank Stella or Ellsworth Kelly. But, resistant to the convention of a painter's personal "touch," Majerus's anonymous canvases intentionally subvert specifications of style or maker -- and offer an alternative to individualistic heroics. Following Tex-Mex (the single painting in the show that is uncompelling, both in its Jasper Johns reference and its expository cultural commentary), Majerus returns to his video game theme. Space Invaders 1 is placed, floor-plan-wise, post Space Invaders 2, and serves as an acknowledgement of the past, and a pointer to memory. (A viewer literally discovers the installation prequel by turning around.) Meticulous with his deceptive randomness, No style No points, by wide, whipping brush marks, indicates a perception shaped by candy colors and semi-intentionality.